As part of our Catholic Christian family, there are many other local, diocesan, national, and international organizations that fulfill our baptismal call to reach out to our brothers and sisters. Listed below are links to a number of different ways that you may choose to get involved in our church and local community. AA/ALANON – A local chapter of AA/ALANON meets at Holy Family Parish on a regular basis. 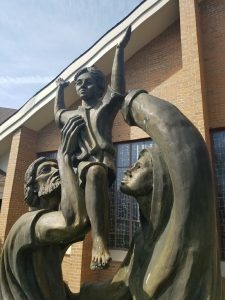 Catholic Human Services – Since its founding in 1972 by the Roman Catholic Diocese of Gaylord, Catholic Human Services has been committed to making a difference in the lives of the people in Northern Lower Michigan. We serve individuals and families regardless of faith, income, race, or ethnicity. Catholic Relief Services – Catholic Relief Services carries out the commitment of the Bishops of the United States to assist the poor and vulnerable overseas. They put faith into action to help the world’s poorest create lasting change. Compassionate Friends – A local organization that supports families after the death of a child. A local chapter meets at Sacred Heart Parish. FISH INC. – Tawas FISH is a charitable organization and is strictly community based. It is designed to help the needy in our area. Harbor Lights Pregnancy & Information Center – a non-profit organization established in 2010. We provide services to women and men as they face the challenges of a pregnancy. We provide services to women, men and families of Iosco and all of the surrounding counties until their youngest child reaches the age of five. Marriage Enrichment – a ministry of the Catholic Church helping couples live in the grace of the Sacrament of Holy Matrimony. Natural Family Planning – The Diocese of Gaylord has men and women that are trained in the following Natural Family Planning Methods. Marriage in Crisis – Rediscover healing and love and find hope by attending a Retrouvaille (pronounced re-tro-vi with a long i) weekend. The program offers tools needed to rediscover a loving marriage relationship. St. Vincent de Paul of Tawas – Donations and Charity. Helping and Serving the Tawas City area since 1970.